This spooktacular Halloween paint a picture pizzookie has been created! My four year old little girl Kaia and I had a blast with the process, she was such a help too! Preheat oven to 375F (190C) degrees. Lightly flour a flat surface as well as cookie dough and a rolling pin. Roll out dough to about ¼ inch thick and using a ghost cookie cutter press out shape on lower left side of dough. Bake about 12 to 15 minutes until golden. Ghost cut out should resemble a tombstone after baking. Let cool almost completely or until firm enough to gently transfer to another pizza pan lined with foil. Above and slightly to the left of the tombstone using same ghost cookie cutter press out ghost shape and set aside. On the top center of the cookie using a crescent moon cookie cutter press out moon shape and set aside. On the top right corner of the cookie using a classic witch on a broom cookie cutter. Press out a witch shape and set aside. cotton bud to color enough marshmallow pieces to make a small pumpkin and use the green food coloring to color the stem of the pumpkin. For the moon use the yellow food coloring to color pieces of marshmallow to fill the space. Be sure to leave enough marshmallow pieces white to fill in the ghost cut out. To decorate the cookie shapes smear the ghost with cream cheese frosting and place three small pieces of red rope string candy for the eyes and mouth. For the witch cookie use a toothpick to smear dark chocolate frosting as the broom. To the face smear a bit of cream cheese frosting then coat with green sprinkles. Using a piece of marshmallow cut out a small triangle and with the red food coloring paint the triangle for the witches nose. 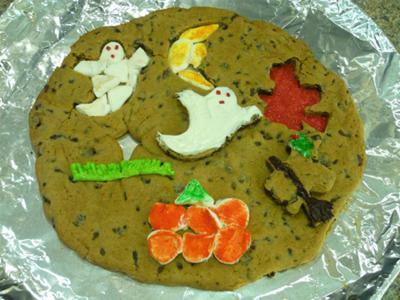 Place the decorated ghost cookie on the center of the large cookie and the decorated witch cookie to the bottom right of the witch cut out. Fill in the ghost cut out with the white marshmallow pieces and using a toothpick poke eyes and a mouth into the face. Insert small pieces of red rope string candy to make the eyes and mouth of the ghost. Fill in the moon cut out with the yellow pieces of marshmallow and fill the witch cut out with red sprinkles. Again have an adult use kitchen shears to partially cut through taffy to resemble grass. Gently press the grass onto the bottom of the tombstone to resemble a grave site with the two ghosts flying about. Finally use the cream cheese frosting as a glue to paste the orange marshmallow pieces to bottom of large cookie to resemble a pumpkin along with its green stem.